There is not a whole lot that is innovative or groundbreaking about Captain Underpants, but it is definitely different. For one thing, it is actually a cartoon. It cares not about giving a 3D look using shading and however else they do it. It is just a good old fashioned cartoon that also includes a sock puppet show, pictures of real animals among the drawn images, and more low-brow humor than you can shake a stick at. The thing is that this movie knows it is using low-brow humor, it makes no apologies for it, and it still winds up being one very funny movie. One thing I found interesting about Captain Underpants is that the voices used are so altered that you cannot really tell which actor is playing which character. I like that because it means that each character can stand on its own, and they have no problem doing that. It looks like Dav Pilkey, the guy who created the original comic book series, decided to set aside all subtle attempts at potty humor and just give everyone two barrels of Professor Poopypants and his huge toilet. It sounds like a boring night at the drive-in for adults, but it is actually an experience you probably won't forget. That was the other thing I liked about this movie; it is set up to be an experience and not just a movie. There is so much going on at any given time that you have to really pay attention to keep up. When the movie does slow down, it only does so to pound you over the head with potty humor. Dav Pilkey learned the one thing about potty humor that guys like Seth Rogen don't seem to understand, you have to point it at children for it to be effective for anyone. The jokes in this movie do not go beyond a fifth or sixth grade level, but that does not take away from how funny adults will find them. If you went to this animated film expecting cleverly disguised humor and fascinating animation, you are going to be sorely disappointed. But, then again, going to see a movie called Captain Underpants doesn't really set the bar very high. The movie is about friendship, how kids perceive other kids with no sense of humor, and how funny it is when a guy named Poopypants is riding a giant toilet through town. If there is one redeeming lesson in this movie, it is that laughter truly is the best medicine and it doesn't matter what form that medicine comes in. 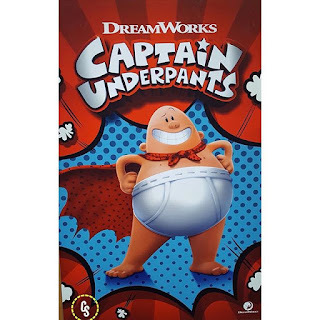 Along with the variety of entertainment forms used in this movie, Captain Underpants repeatedly goes out of its way to let people know how ridiculous it really is. The movie makes no apologies for its look, its humor, or its plot line. Actually, the movie spends much of its time letting everyone know that it understands it is low-brow humor, and that is what helps to elevate the movie to a level slightly above low-brow. You and your kids will laugh at his movie; your kids probably more than you. This is a real cartoon that may even take you back to your childhood when these kinds of shows were popular. The one thing I found odd is that I really did not find myself rooting for Captain Underpants to save the day or for Harold and George to stay in the same class. I was content to just let the movie unfold and see where it was going. That, to me, is the sign of a really good cartoon. George N Root III is a movie fanatic who still watches cartoons. Follow him on Twitter @georgenroot3, or send him a message at georgenroot3@gmail.com. La-la-LAAA!